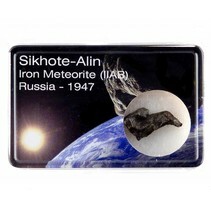 The Sikhote-Alin meteorite fell during daylight at 10:38 local time on February 12, 1947 in Russia. Eyewitnesses reported a fireball that was brighter than the sun. The meteorite left a trail of smoke and dust up to 32 kilometers long, which remained visible for several hours. The speed of the meteorite is estimated at 14.5 kilometers per second or 52,200 kilometers per hour. About 5.5 km altitude the meteorite exploded with a huge blast and scattered debris in the surrounding area. The impact of the Sikhote - Alin meteorite is one of the most spectacular in the written history of mankind. The Sikhote-Alin meteorite is classified as group IIB, 5.9% Ni, 0.42% Co, 0.46% P, about 0.28% S, 52 ppm Ga, 161 ppm Ge, 0:03 ppm ir. Wher the remaining part of the meteorite is from iron.